Thursday, November 15 from 8 a.m. to 9 a.m. Doors will open at 7:30 a.m. for breakfast and networking. 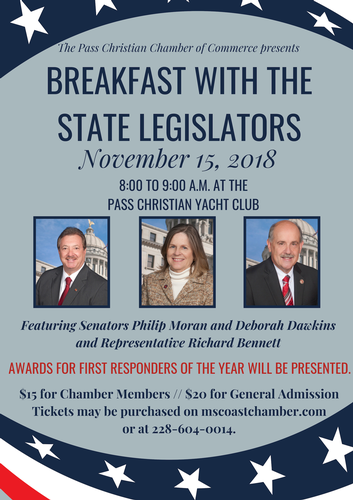 The breakfast will be held at the Pass Christian Yacht Club which is located at 120 Market Street in Pass Christian, MS. It is open to the business community and will include a full breakfast. Member admission is $15 and general admission is $20. Breakfast with the State Legislators was developed several years ago to educate the business community on advocacy issues and legislative activity. The breakfast event allows for an improved understanding, knowledge and expectations on issues of importance locally and statewide. Mississippi Gulf Coast Chamber of Commerce, Inc. and the Pass Christian Chamber of Commerce is a nonpartisan agency with a vested interest in facilitating information.